The Internet of Things (IoT) is a technological revolution that represents the future of computing and communications world. In this blog post I will explain IoT and describe how the Microsoft Azure Internet of Things Suite provides new services that help organizations get value from the device and sensor data they collect every day. At a high level, the Internet of Things (IoT) is a concept that encompasses the automation and control of all things that matters to your business using internet architecture. This can be achieved by building intelligence into all machines (computers, devices…etc.) in order to communicate with each other through the internet and complete activities without having manual interference. The reality is that the IoT offers endless opportunities and connections to take its place. It certainly opens the door to a lot of opportunities but also to many challenges. The IoT needs an open architecture to maximize interoperability among heterogeneous systems and distributed resources including providers and consumers of information and services, whether they be human beings, software, smart objects or devices. The Internet of Things (IoT) refers to the capability of devices that collect and transmit data through the Internet and connect to other devices and people through the existing Internet infrastructure. Devices connect and communicate in many ways depending on their nature. Smartphone Connectivity: Smartphones are able to connect to the Internet and capable of remotely controling household appliances, personal computers, and personal vehicles…etc. SmartGrid: The term “Smart Grid” encompasses a host of inter-related technologies rapidly moving into public use to reduce or better manage electricity consumption. Smart grid systems may be designed to allow electricity service providers, users, or third party electricity usage management service providers to monitor and control electricity use. Event Data Recorders: Automobiles are integrating computing technology that enhance the ability of others to collect location and operational data in near real time. In the data driven economy, this data is of value. GPS Connectivity: GPS capabilities in vehicles mean that the location of the vehicle is recorded at all times, leading monitoring of cars and collection of all location data. Smarthome Connectivity: Smarthome connectivity is when one’s appliances, such as an oven, security system, or lights, are connected to one’s smartphone through the Internet. We can be able to control these smarthome devices remotely through smartphones. Connected Health and Fitness: Medical and fitness devices can monitor one’s health and track changes and physical activity. These devices can be connected to a person’s smartphone or laptop for data aggregation and tracking. Many IoT solutions will provide very deep and near-real time insight into industrial and business processes, but privacy matters. Devices connect to different types of other devices and share data. This increase challenges in controlling data and connectivity. This increased number of access points also poses a security risk, for example, devices may link bank accounts, email, household, personal health data, business account data…etc. Security and privacy were of the utmost importance. Companies may need to improve the policies that they have in place in order to control their own data and ensure that consumers (customers, partners, developers…etc) are offered opportunities to access and interact with the IoTs securely. The new IoT architecture should include the best security features for both software and hardware devices with end-to-end encryption and authentication and privacy policies. With this emergent enterprise software trend, IoT is progressively taking its place to enter into the mainstream, and many companies have already started investing in this IoT space thinking ahead of future competing business needs and benefits. This is a clear sign that industries are maturing and framing out the capabilities of future generation of the enterprise IoT solutions. Microsoft is one of the many vendors that envisions huge opportunities in this IoT space. Microsoft made innovative movement with the release of Azure IoT Suite having new services that help organizations get value from the device and sensor data they’re collecting every day. 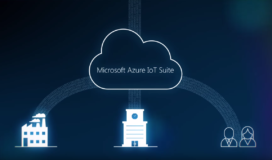 Azure IoT Suite is a preconfigured set of services for connecting sensor-equipped devices to the Azure cloud, capturing the data they generate, and managing and analyzing the data. Microsoft recommends Azure IoT Suite which is ideal for customers with large fleets of sensor-connected devices, and includes technology for remote monitoring, asset management and predictive maintenance. Microsoft Azure IoT Suite security strategy collaborates both cyber software (IT) and physical devices (OT) in making “cyberphysical” systems safe and secure. Microsoft cloud security principles follow a proven model that provides secure communication between devices with associated services, and also with other devices across local network boundaries, is the “Service Assisted Communication” approach, which brokers all communication with a device through a trusted gateway at the field or cloud level. 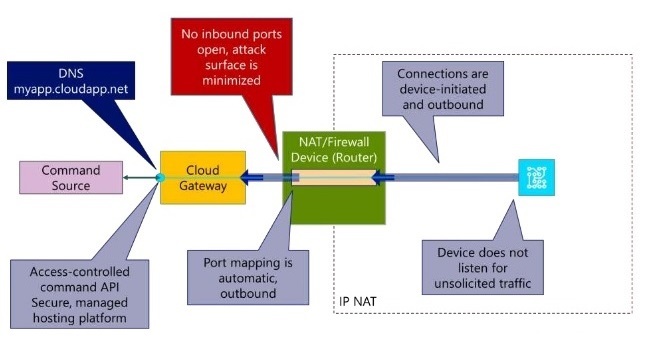 This lets the device act as a network client to the gateway through an individually peer-secured channel, limiting susceptibility to unsolicited and potentially malicious connection attempts from unknown parties. All messages for the device are sent to the gateway, which implements manageable access-control policies. Microsoft Azure IoT services provide hyper-scale connectivity capabilities for the collection, processing and storage of IoT device data. They also enable secure communication handling between cloud and devices or field gateways, to realize the Service Assisted Communication model. Microsoft is deeply committed to keep customers’ data private. Microsoft’s cloud services have been certified under the ISO/IEC 27018 cloud privacy standard and are compliant with a broad range of further security related certifications. Azure IoT Suite’s data analysis helps in identifying problems before they lead to failures, which saves the company time and money. The Azure IoT Suite includes Microsoft’s Azure Machine Learning service, its Azure HDInsight Hadoop service, and its PowerBI tool for visualizing IoT data. For more information on Internet of Things (IoT) and enterprise IoT solutions, visit our IoT capability page.